Do you ever binge-watch movies just before a new sequel premiere? 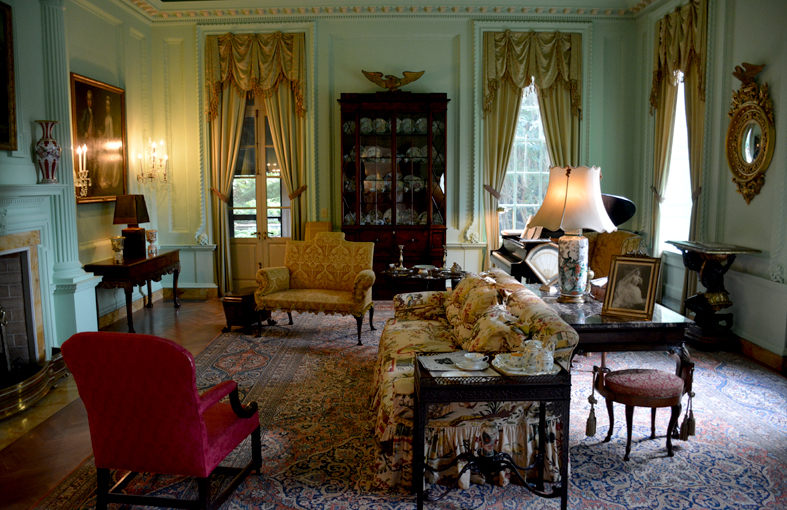 I do, but here's one better...before Mockingjay: Part 2 hits theaters this November, go on the Atlanta History Center's behind-the-scenes Swan House Capitol Tour! You get to see filming sites, movie artifacts and learn bits about The Hunger Games: Catching Fire and Mockingjay: Part 1 that most people never will! By the way, President Snow is not the only one who can wield a white rose with confidence! 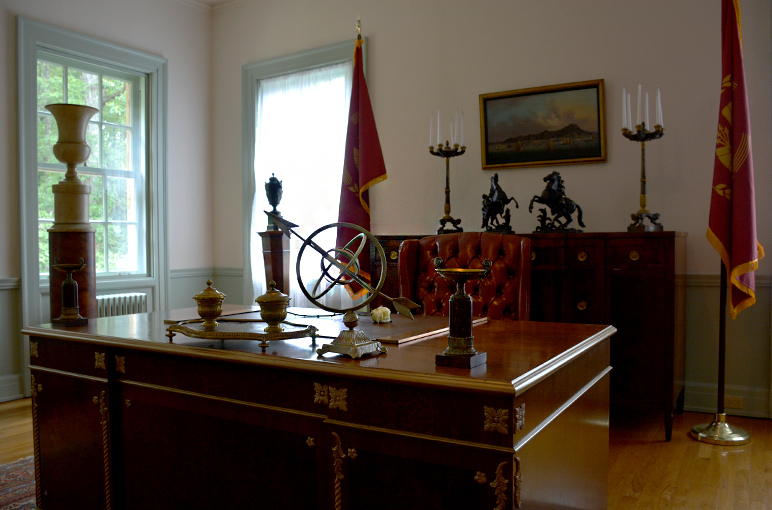 There are an incredible many awesome aspects to this tour, yet I do think that sitting at President Snow's office desk is among the top! This room is not on the general Swan House tour (which is another one I highly recommend!) and many of the artifacts located here are from the movies. The desk here is a remarkably similar desk to the one in the movie, however, the real one was purchased by the president of a neighboring country! You're going to learn quite a lot of fun facts when you visit. I remember the very first trailer (here's a clip) I saw for The Hunger Games: Catching Fire that included the scene of President Snow's mansion, what we Atlantans know as the Swan House, and just how exciting it was. It was magnificent to know that such a beloved Atlanta icon was going to be on the big screen in such a fantastic way! 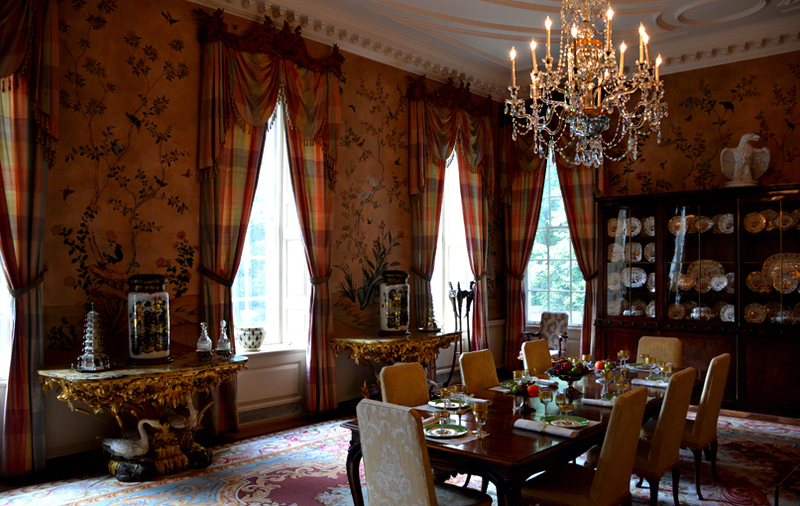 You'll see a lot on the tour, including the wallpaper in the Dining Room, which is gorgeous! It features 50 kinds of birds, and not a single one repeated—although I do not think there's a mockingjay, but feel free to explore. It's original and a bit faded, so you can just make out a hint of the original watermelon pink color...which is quite stunning, and in spectacular condition given the house was completed in 1928! 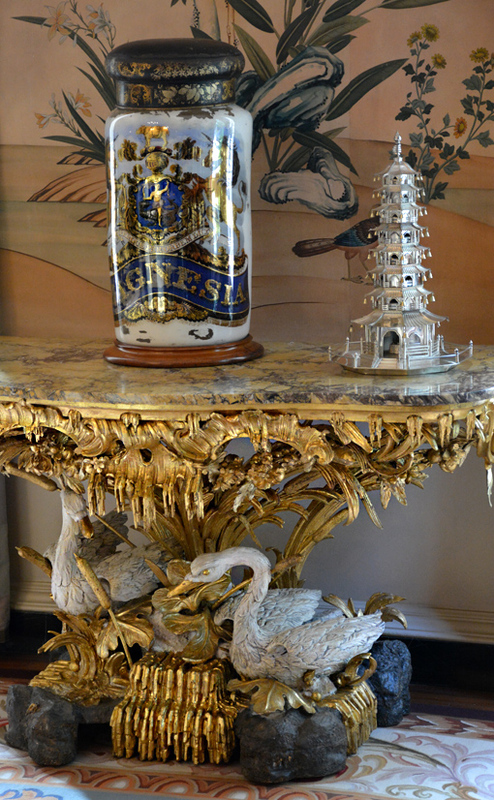 If you've toured the Swan House before, you know that it gets its name from the swan motif throughout the house. Many of the house's swans appear in the The Hunger Games movies filmed here, including the gorgeous swan tables in the Dining Room. When my tour guide found out that my middle name is Swann, a huge smile crawled across his face. And I have to admit, splendor aside, I love that I have something in common with the Swan House, one of the more spectacular icons of Atlanta. This room, not the only one under lock-and-key, is reserved for patrons of the Swan House Capitol Tours. That's to say this is a special tour and one you will not soon forget! 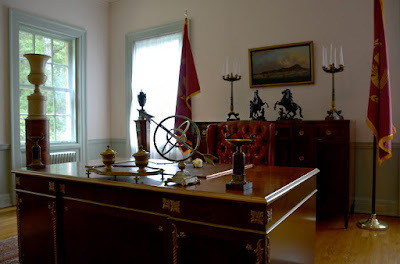 The photograph of me sitting at President Snow's desk wasn't my first photo at a presidential desk. My first was sitting at the president's desk...in the Oval Office...in Madame Tussauds'...in New York City. 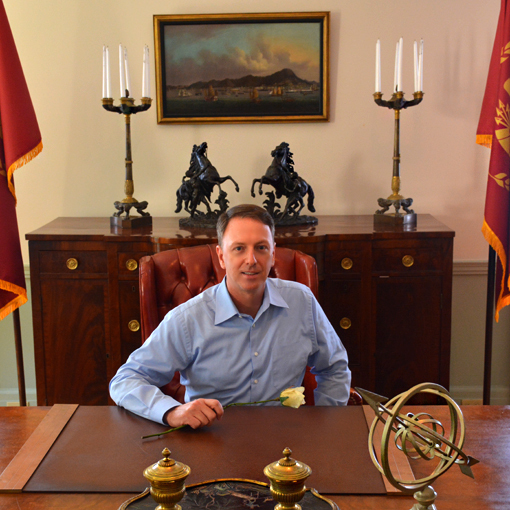 So, while I've yet to tour the White House in Washington, D.C., I have now sat at TWO presidential desks! I told you...I'm a "professional tourist"! 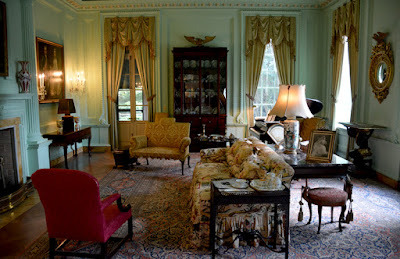 The Swan House's Morning Room, originally a pistachio green color, was used as President Snow's office in the movies. The room was painted white for the films and then repainted pistachio green after filming. Preservationists (and I consider myself one), DO NOT FRET! The room had been restored to its original color far prior to the agreement with the film studio. So, they did not paint over original paint. Personally, I think it's awesome that the Inman's 1928 home has been immortalized in a globally sensational movie! Generations from now, many will enjoy the splendor of Swan House. How cool is that! It's quite fascinating how much the Swan House mirrors the magnificence of the producer's vision of President Snow's home. 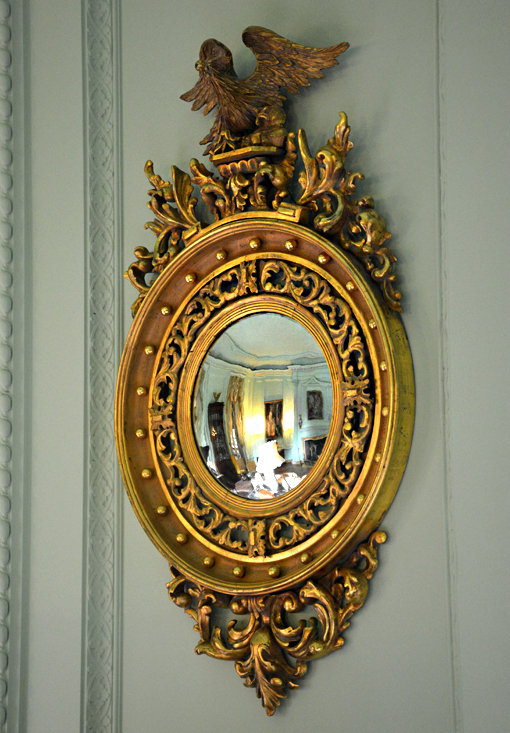 The set of convex Federal-era mirrors in the Swan House's Morning Room were left in-place for scenes in the movies. They're absolutely stunning, so it's not a surprise, but a wonderful happenstance that visitors on the Swan House Capitol Tour get to see them up close and personal. 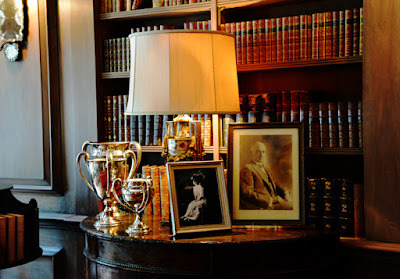 From the Swan House Library you peer out onto the side porch, which was President Snow's breakfast room, where he enjoyed a meal with his granddaughter. That side porch lets out onto the Swan House Gardens, which I hope visitors spend a little time exploring prior to their Swan House Capitol Tour. 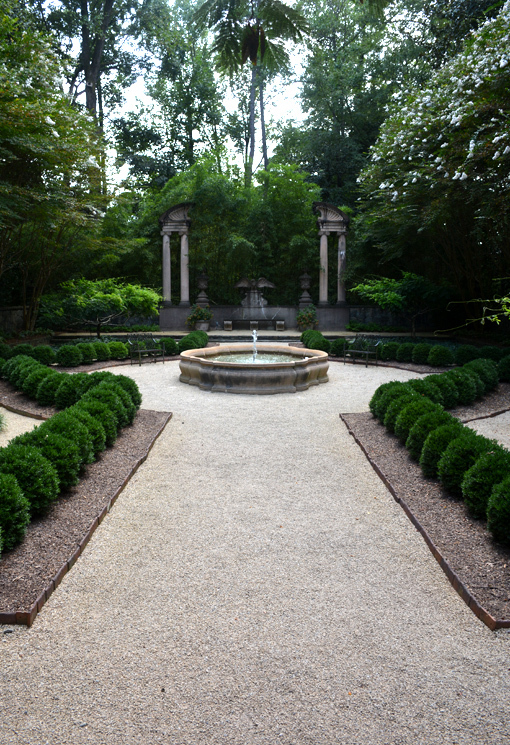 The above pictured garden was the scene of a grand party in The Hunger Games. You get to explore the many gardens of the 33-acre Atlanta History Center complex during your visit, and during the tour you'll get to see photographs and video of many of the spaces you're visiting on the tour, which makes it more real-time, realistic, as-if-you-were-there! I'd be totally remiss if I didn't say "Thank you" to my awesome tour guide, Mirgill Joseph. 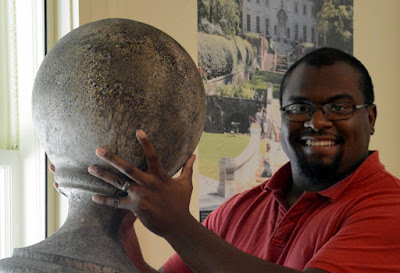 He's been with Atlanta History Center for more than eight years and does for the Center a lot more than give tours. This wasn't my first Margill tour, and he's been consistently fantastic! And he's pretty strong...look at that lift! 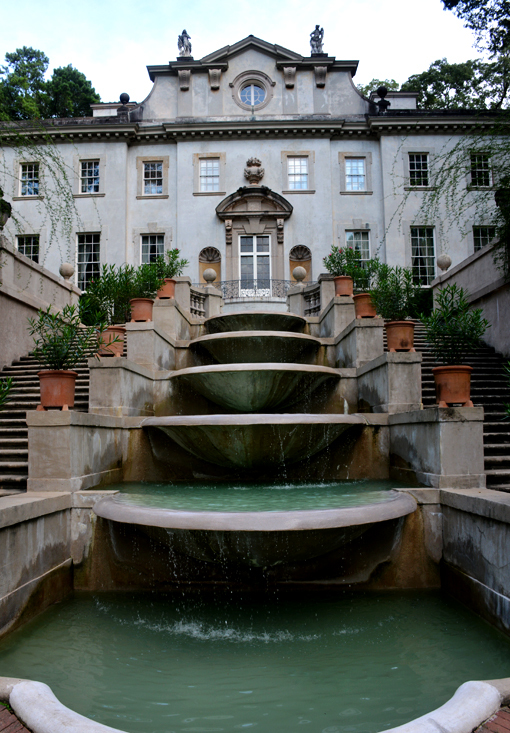 THIS is your grand opportunity to walk in the steps of Catnis Everdeen and Peeta Mellark...merely by going on an Atlanta History Center wholly unique tour. Its Swan House Capitol Tour!